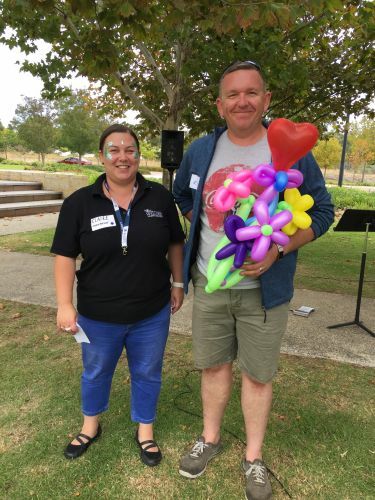 Kevin Frampton accepting his Neighbour of the Year balloon trophy from The Village at Wellard Residents Association Chair Claire Cardew. KWINANA resident Kevin Frampton was announced the community’s Neighbour of the Year at an awards ceremony in The Village at Wellard last Sunday . Mr Frampton was nominated by many of his neighbours. “I wasn’t expecting it,” Mr Frampton said. “ I was painting stones with my daughter when I heard mention of my shared lawn mower named Kev which I lend to everyone in the street and I knew it was me they were about to announce as Neighbour of the Year. After being crowned Neighbour of the Year and accepting his balloon trophy, Kevin celebrated with his neighbours at a taco party. Kevin and his family were part of the group of more than 100 residents who joined in the celebration at the third annual Neighbour of the Year event. “There’s a group of eleven or twelve families who live around the nature play park and we all get together and have barbecues regularly,” Mr Frampton said. “I’m always happy to lend tools or help with whatever handyman tasks are needed around the neighbourhood.